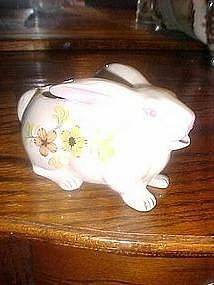 A great bunny rabbit creamer for your creamer collection. Made of hand decorated glazed ceramic. The pitcher measures 3 1/4" tall and is about 5 1/2" long. Decorated with spring flowers. Perfect condition with no damages or repairs. OOps! Sorry about the camera glare from the flash.